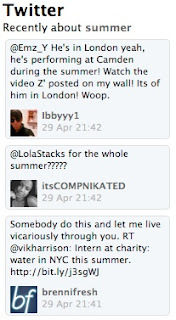 Tweets on 'summer' embedded in a page. So, last weekend I decided to find out how much work it would take to display a Twitter search using Spring Social with Blossom, the Spring integration for Magnolia CMS. Magnolia calls reusable components that you can snap into a page paragraphs. I wanted a paragraph that an author could add to any page to show relevant tweets about its topic. The author supplies the search query and the maximum number of tweets to display.On the right is the end result. Twitter provides a RESTful API that can return JSON or ATOM. There's a lot of functionality in there and most of it requires OAuth authentication. For this example we'll do a simple search which doesn't require authentication. Spring Social offers an OAuth implementation that is compatible with Twitter and seems to be minimal effort to use. A twitter search using the API is done with a request like http://search.twitter.com/search.json?q=summer. Spring Social uses RestTemplate and parses the response using Jackson to return plain java objects representing the tweets. Since Blossom is an extension of Spring Web MVC that lets Spring controllers be embedded into the content of a page the twitter search paragraph is implemented as a controller. 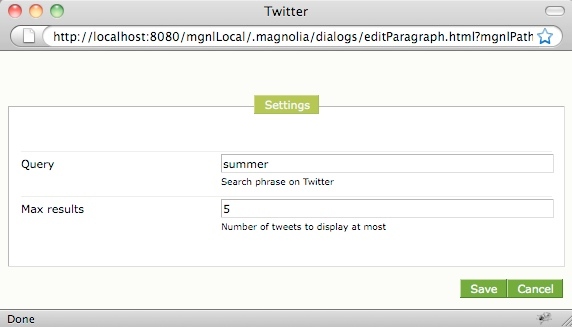 The interface provided to the author to enable filling in the search query and the maximum number of tweets is provided by Magnolia using dialogs. By adding methods in our controller and annotating them Magnolia will call them when the dialog is to be displayed and for validation when its submitted. The view for displaying the tweets is a JSP. In the source below you'll see that Spring Social makes things really easy since it will request the Twitter API and return the tweets with just one line of code. If you haven't used Magnolia or Blossom before this screenshot might be helpful to see what the dialog presented to the author looks like. The methods annotated with @TabFactory and @TabValidator are used to provide the user interface and validate the input. And here's the source for the view. To try it out you need to add their milestone repository since Spring Social has still to reach its 1.0 release. Here's the maven snippets you'll need. Thanks this is Awesome !!! I know it's an over kill to use magnolia for personal blog. But i'm planing to use it as such. No matter what the cost. I don't have any other serious reason to begin a practical journey into magnolia world ... but who knows maybe one day for a non profit organisatino website or for a school website in africa ... ans so on. Magnolia rocks man. I am definitely going to give it a try.